Looking for a good dog treat to give your pup, but sick of all the artificial additives that are usually found in manufactured dog treats? Make your own with one of these five recipes. 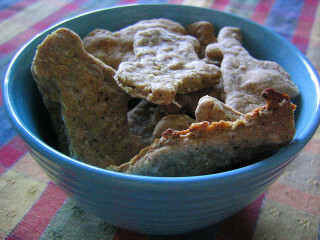 Your dog will love these gluten-free peanut butter bacon dog treats. 1 cup brown rice or whole wheat flour. 1/2 cup all-natural, unsalted peanut butter. Preheat your oven to 350 degrees, and mix all wet ingredients in a medium-sized bowl until blended. Add flours to the mixture to create dough. Roll the dough between two pieces of parchment paper until about 1/4 of an inch thick, then cut with a cookie cutter of your choice. Place on a baking sheet and bake for 20-25 minutes. Let the treats cool in the oven, and they're ready. All natural chicken jerky can make the perfect, healthy treat for your pup. 1 1/2 lbs. skinless, boneless chicken breast, sliced into 1/4 inch strips. Rinse off the chicken strips and remove any fat. Lay them out on a tray or cookie sheet so they aren't touching each other. Place the strips in the oven and bake for about 2 hours at 200 degrees. If you're using a food dehydrator, set the temperature at about 140 degrees and let it try for about 3-12 hours. You'll need to check the strips once per hour, there should be no moisture at all once they're done. The perfect summer treat for your dog. 32 ounces all-natural vanilla yogurt. 1 cup all-natural, unsalted peanut butter. Melt the peanut butter in a pot or a microwave safe bowl. Mix together with the yogurt and pour the mixture into cupcake or popsicle molds. Place in the freezer, and let freeze for about 3-5 hours. This healthy vegetarian dog treat can be made with most fruits and vegetables, and your dog will love it. 2 1/2 cups wheat flour. 3/4 cup dry milk powder. 1/2 cup carrots, green beans, blueberries, apples (no seeds), or another vegetable of choice. Mix all ingredients in a large bowl to form ball-shaped dough. Roll the dough on a flour-dusted surface until it's about 1/4 inch thick. Once the dough is flat, cut out pieces with a cookie cutter of choice. Bake for about 30 minutes at 350 degrees. The egg can be omitted for a vegan alternative. Your dog will love this simple, tasty treat. 2 cups whole grain flour. Puree liver in a food processer and then add eggs and whole wheat flour. Grease a cookie sheet with some olive oil spray, and pour the mixture onto it. Bake for about 20 minutes at 350 degrees. After ten minutes, flip it over. Once it's done baking, cut into squares or cut with cookie cutters. 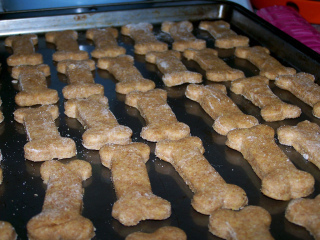 Your dog will love these homemade dog treats. Try to use all natural ingredients, and have fun. Bicyclist and His Rescue Dog Set Guinness Book Record During 14,000-Mile Ride! A Dog and a Magpie Playing Together? The Cute Animal Video of the Day!! !